It was Thursday noon and I was so scared that they would not let me do it. I went to the mirror and told myself that this time they will let me ride my bike. I wanted to become a policewoman so I could save people’s lives. I especially wanted the uniform. Can you hear the voices and laughter of families? Their shouting is soon replaced by cheers. 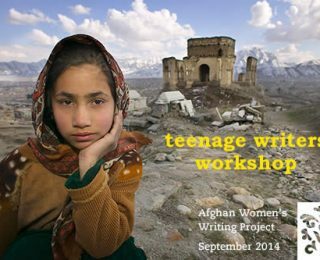 The stories and poems posted this week were written by girls in Afghanistan participating in the Afghan Women’s Writing Project in small online writing workshops dedicated to teenage girls. Girls should never believe only what people tell them or think of them. I want to see my country like other countries in 20 years. Everyone should have equal rights, peace, and stability.